Succulent beer-battered mushrooms seasoned with flavors like chipotle and smoked paprika. Served up with a slow cooker queso cheese sauce with beer and roasted poblano pepper, these bites take summer party grub to a whole new level. It is SUMMER! I so love it here. We had the most gorgeous spring, first of all here in sunny Florida. But now school is out, my stress level has come back down thanks to many beach walks and much pool time. Life is finally fantastically good once again. Yeahhh, that was Corona Extra you just scrolled past. And I’m not a resort or in Mexico or anything either. Just my backyard, just feet from my lime tree. I don’t normally bring glass out by my pool, but our local store just happened to be out of cans (of course, it is beach season here) and I really wanted to show that chill summer packaging. That whole scene 💙 is my life …as much as I can make that happen anyway. 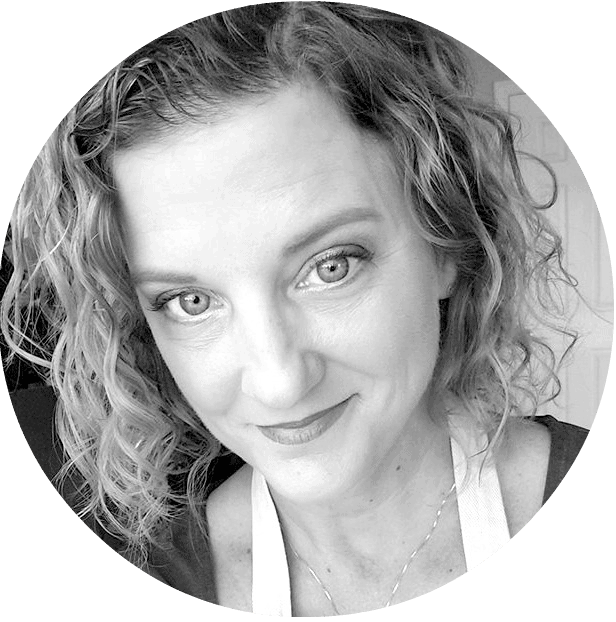 In between all the mom-wife-daughter-friend-sister-job-volunteer-blog-LIFE stuff. Sipping on a Corona Extra sitting in an Adirondack watching all the nature going on out back or while having a good float in the pool under the warm sun. It refreshes, replenishes, and brings me back to a glass-is-half-full state of being. Which is where we all belong, don’t you think? So, you think you’ve had Beer-Battered Mushrooms? Do yuh? You like them? Then Honey, you have GOT to try these. This recipe takes mushrooms to a whole other world with bold flavors that are just ridiculously good. Crazy good. Crispy seasoned batter. A truly flavorful cheesy dip. And all very easy to make. First, is the queso. We roast a couple poblano peppers in under the broiler (easy). Then we skin, seed, and dice them and throw them in the crockpot with the rest of the queso ingredients. Done. …and by the way, one of those queso ingredients just happens to be a beer. We are so winning. So, when all is said and done you have light and crispy mushrooms to dip in queso. Because this queso makes a good amount, you can also serve celery sticks, baby carrots, and tortilla chips too! And now you have a party, and it was totally easy. 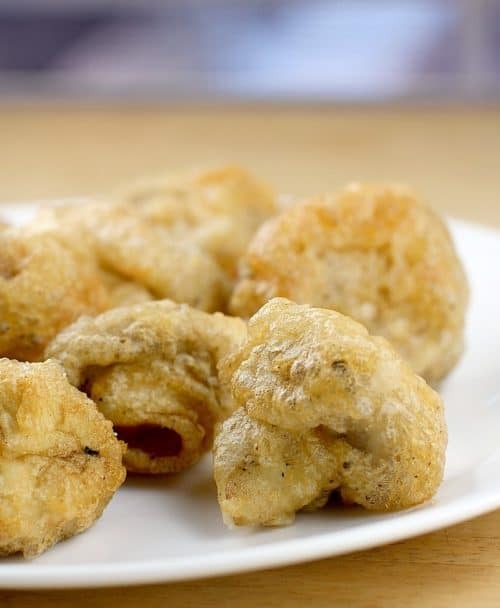 One hint on the Beer-Battered Mushrooms is that you do want to serve them right away – or at least once cool enough to eat. 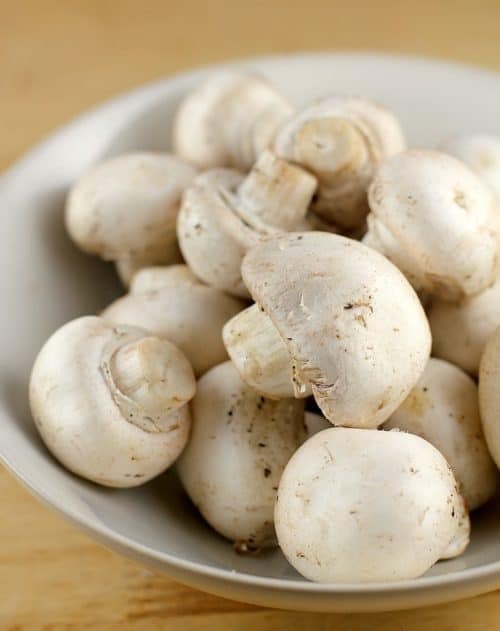 Mushrooms are loaded with water, so if these sit for an extended period of time that water will move into the batter crust and soften it up. No bueno. So that’s it folks! Enjoy a cold one, PIN this recipe for Beer-Battered Mushrooms with Poblano & Beer Queso, and grab summer by the horns. 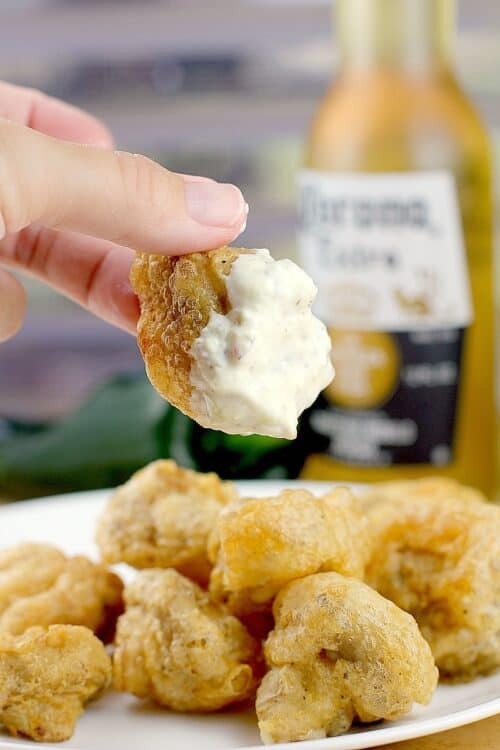 Beer-battered mushrooms with an easy-tasty poblano-beer-queso dip. Boom. Here’s to making every moment more enjoyable! Turn on the oven broiler. 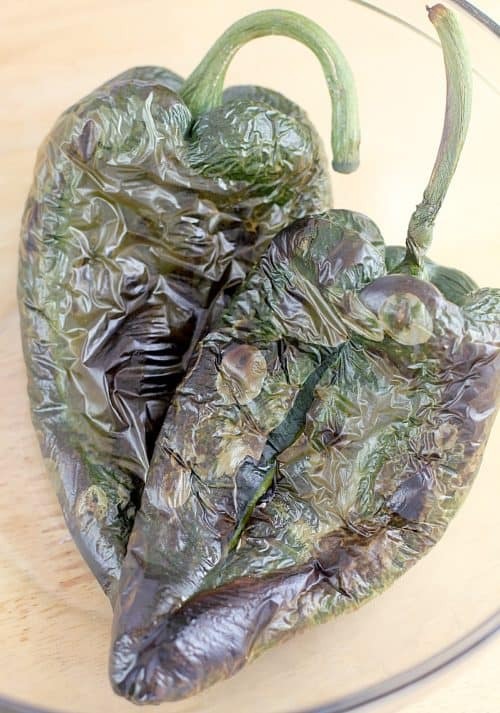 Roasted the poblano peppers 15-20 minutes, rotating occasionally, until skin is blistered all over and peppers are tender. Place in a ziploc bag to steam until cool enough to handle. Discard the stems, skins, and seeds. Dice finely. 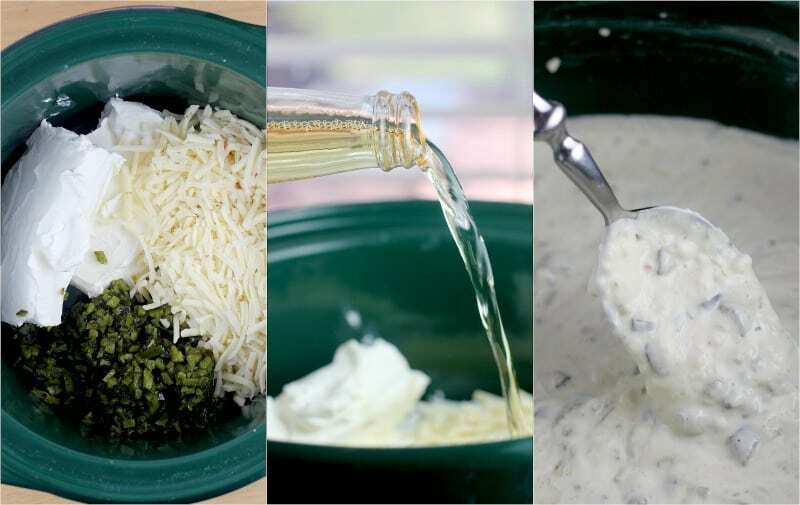 To a small slow cooker, add the diced poblano pepper, cream cheese, beer, and cheese. Heat on high until creamy smooth (~ an hour; you can turn it to low if you need it to sit a while and you can add more beer to thin it out if it thickens too much). 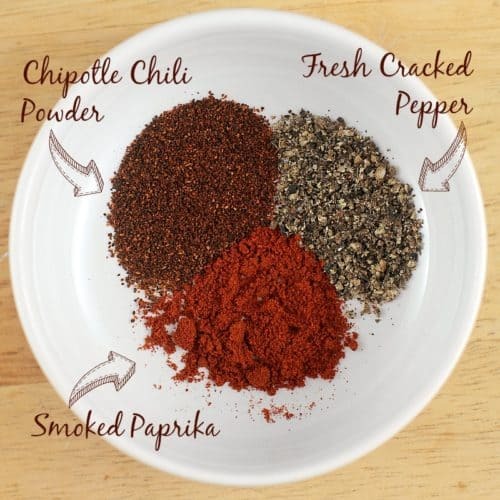 Once the flavors are blended and cheeses are melty smooth, taste and adjust to desired heat level with the hot sauce. To make the mushrooms, whisk together the flour and seasonings. Slowly whisk in the beer. 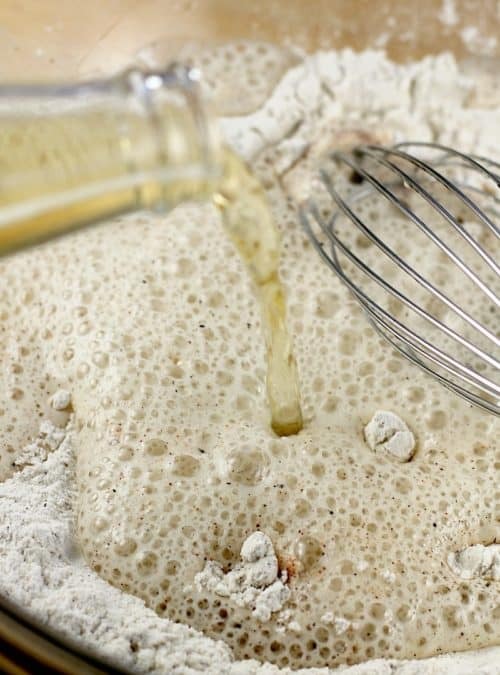 Let the batter sit a couple minutes for the flour to absorb the beer and for the mixture to thicken. Heat oil for frying. I used a cast iron skillet with an inch of oil. Serve mushrooms with the queso for dipping. Remember to never wash or submerge mushrooms. They are little sponges and are ruined by water. I find a small paint brush does the job. My poblano peppers were large, but tame heat-wise, so I added a tablespoon of green habanero hot sauce for zip. But I have also had spicyyyyy poblano peppers. So simply use some hot sauce to adjust the queso to your desired level of heat. 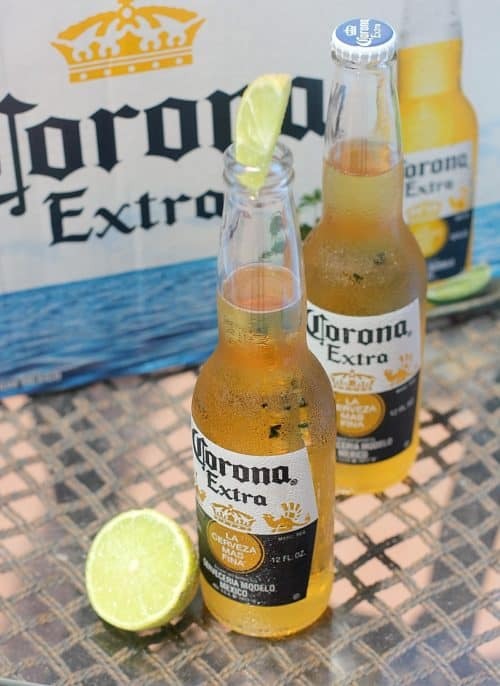 Visit the Corona Social Hub HERE. And leave me a comment! 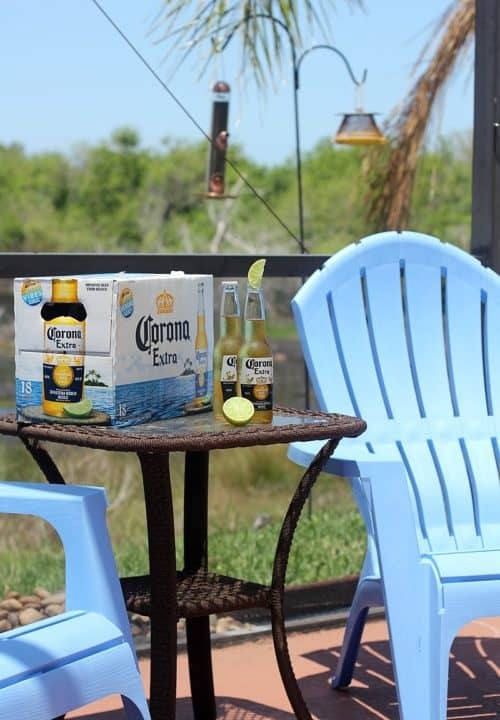 How do you enjoy your summer cervezas? Not a mushroom eater myself, but my wife loves them. So showing her this recipe! I love mushrooms but never had them like this before. That looks soo good! I wish I could have a nice cold one right about now.